We’re drawing close to the end of the year, and I’ve been thinking about resolutions and what 2018 holds in store. I’m bracing for the worst and hoping for the best on that front. Thanksgiving made me think of what I’ve accomplished this year. 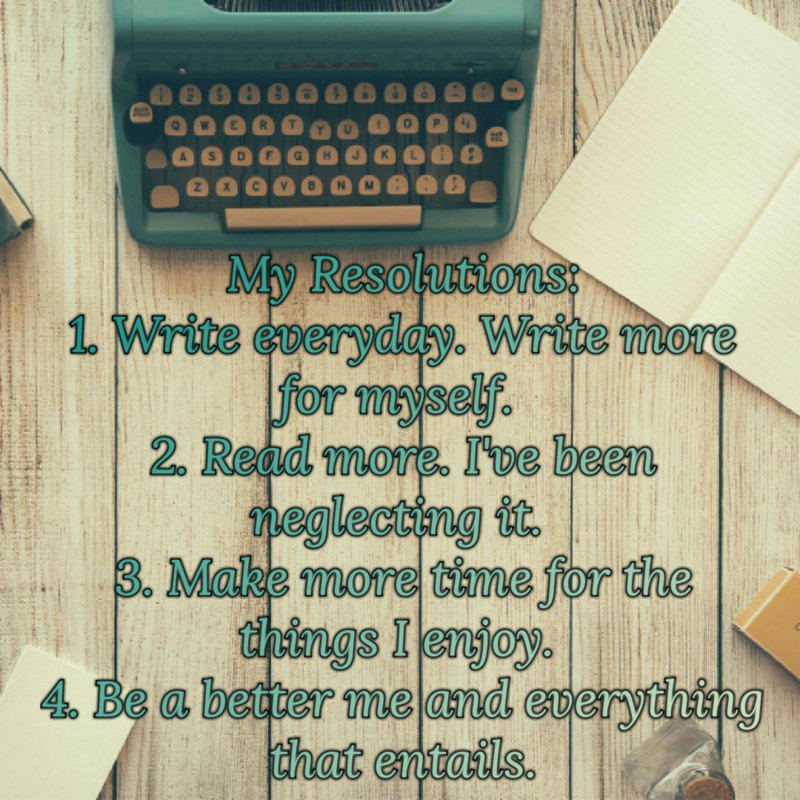 I remembered that at the beginning of 2017, I made a list of resolutions that were reasonable and within reach. A teacher once told me that accomplishing a list of small goals can lead to fulfilling big goals. Good advice, I think. So, did I accomplish my goal list? Well, I started a blog. I did write more. I did write more for myself. I do write almost everyday; even if it’s just scribbling a note of something I like, writing down a plot idea, or a blog thought. I’ve found that several intended blog posts have been stashed in my back pocket. After writing them and reading over them, they felt too personal. I felt like I wasn’t quite ready to share those. However, I hope they will find themselves here eventually. I did read more. I joined a book club, and that helped. It’s been a wonderful experience and has helped to diversify my reading. Along with meeting all my book buddies and getting their varying opinions on books, I’ve broadened my social life. Make more time for the things I enjoy. That one is tricky. I suppose since my favorite things are reading and writing, I achieved that one as well. Be a better me. I feel like the last few years have really helped develope who I am as a person. I’m finding more of where I fit into the world and the impact I want to make on it. With the blog, I’m finding my voice, so to speak. My opinions are more easily shared, and I find I’m more outspoken. I’ve done many things I’m proud of this year. I do yoga. I’m in a book club. I have a blog. I did a big Thanksgiving meal mostly on my own. I’ve learned a lot. Most importantly, I’ve held it together. Here’s to hoping next year brings more firsts, more accomplishments, and more joy. I’m proud of my writing from this past year. In many ways, it feels like some of the best I’ve ever written. I feel more and more free in my expression with every passing post. I no longer feel the need to make it into an “enterprise”, which was always a huge hangup for me. Now I just appreciate it as art, and a means of connection. One of my hopes for you, in your continued growth in your writing, is that you also continue to get progressively more free as well. I’m so glad you started your blog. I’m so glad you joined the book club! And I’m just so glad that we are now friends! I also hope you can make connections with other writers here on WordPress. I’ve done that in my writing and met some really wonderful, amazing people. Kindred spirits. All through writing! My goals for the upcoming year are too lengthy to express here. I’m sure I’ll blog about those the closer to 2018 we get. Writing has its own evolution and that’s one of the great things I love about it. Without your and LaRue’s support, I honestly don’t think this blog would have happened. I couldn’t ask for better friends. I look forward to reading about your goals.